We've already had an awesome ride this month. We went from the trailhead in Pleasant View to Stan Thompson's Shoreline in Willard. It's a lot like the Bonneville Shoreline trail in Ogden, but taken to 11. It has steeper climbs than the rest of BST, but without being too much. It's much more technical as well. We rode it at night on the snow so it made it more difficult to find our way to the singletrack, but we found some additional good stuff. It was the perfect temperature to keep from overheating and we had a full moon so the lighting was great for spotting nocturnal creatures. We'll definitely be doing that ride again, but we'll have to wait for it to dry out now that the weather has turned back to Spring. And because it's Spring, you need a new Yeti! Lucky for you, The Bike Shoppe is having a sale. We've marked down all Yeti 575 and Carbon SB-95 at 20% off! All Aluminium SB-95s are 25% off. Any other Yeti purchase this month gets you a dropper post and tubeless set up included. 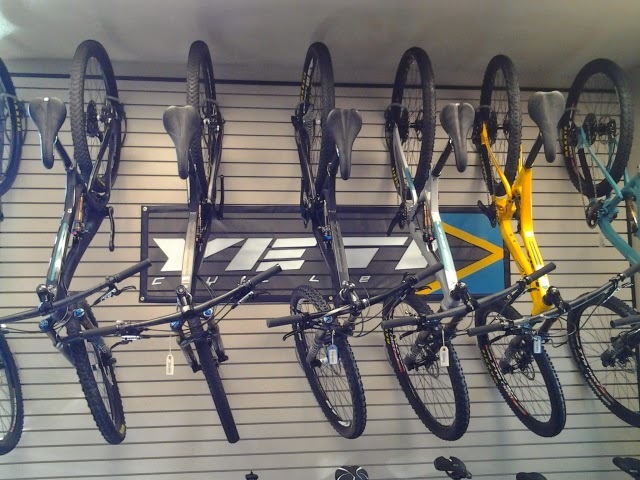 If you are only 95% certain that you want a new Yeti, try one of our demos. Riding one will take that last smidgen of doubt away. Even if are only 5% convinced that a new Yeti is in your future, riding one will still make it easier to start a new love affair with a Yeti. And if that isn't easy enough for you, we'll even bring you a demo bike on our group rides. This month we'll be riding on Saturday mornings at 8:00. We'll be riding Bonneville Shoreline this month starting on 3/14 we'll meet at the BST trailhead on North Ogden Divide. On 3/21 we'll meet at the mouth of Ogden Canyon and ride North. This is the trailhead across from Rainbow Gardens. 3/28 we'll meet at Beus Canyon trailhead. We'll be posting everything that's happening each month so you know what to expect and where we're riding. We'll also post the results from regular wheelie contests as well, so practice up and you could be a winner!